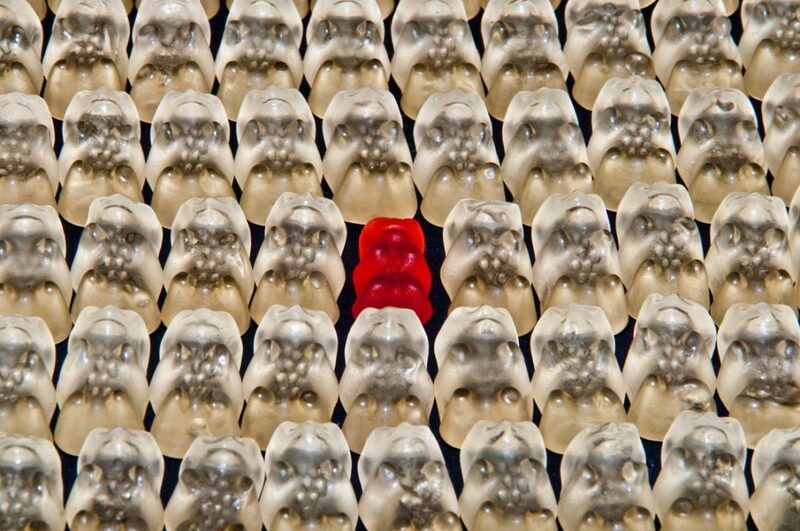 How To Find Your Unique Voice & Stand Out Online | Conscious Copy & Co. Think about your favorite character from a TV show, movie, or book. What is it about that character that draws you to them? Perhaps you see yourself in their unwavering determination. Or their ability to overcome the most challenging of obstacles. Maybe you were brought up in a similar small town, or made a move to a big city like they did. What is it about them that makes them so relatable and lovable? Now, think about this: If your business were a character, what character would it be? In this article, we’ll dive into how to create a relatable character using The Character Diamond, and how you can use this process to infuse personality into your online persona to better connect with your ideal customers. When Hollywood screenwriters create characters for a movie, they use a process like The Character Diamond to develop characters we can connect with. If they’re not relatable to the person watching, they become irrelevant, the whole story loses impact, and the movie falls short. When I first learned this process, I saw a huge connection to writing copy. When we want to get a message out there—whether we’re an influencer, brand, or a business as a brand—we need to make it relatable in order to connect with our audience. When I first started teaching The Character Diamond in my 1:1 strategy sessions with clients, my goal was to get them to better understand their messaging. But, I discovered that by going through this process, they started to actually understand themselves much better. The breakthroughs that have come out of this exercise have been truly transformational. Why? As entrepreneurs and business owners, sometimes we feel like the most misunderstood people on the planet. You can use this process to discover what makes you uniquely you. 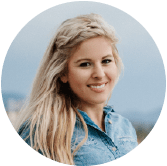 This will help you infuse personality into your brand so you can convert readers into loyal customers, just like Hollywood screenwriters create famous icons that turn us into raving fans. The Character Diamond is a proven way to develop characters who have a rich, compelling emotional journey and a dynamic set of internal and external personal conflicts. When you use this in your messaging, you can create a character that leaps off the page with a compelling and memorable emotional journey. Your North Star is your superpower. It’s the thing that makes you uniquely you. It’s how you show up that makes you so different than everyone else in the world—your one-in-a-million-like strength. To uncover it, ask yourself what other people admire about you. Here’s a classic movie example: Forrest Gump. His North Star is his simplicity—and the strength to overcome the final challenge at the end of the movie. He was simple in everything he did in life and how he showed up. To uncover your North Star, look at the areas in your life where you’ve seen massive success. If you have trouble figuring this out, you can ask your husband or wife, or your co-workers, “What do you see as my superpower?” It’s important to note that this isn’t something you’ve accomplished; it’s something you innately do. The next step in The Character Diamond is your kryptonite—the #1 thing that always takes you down. Go through your life and start to think about the one thing that continues to get in your way of achieving success. This is the trait that has led to specific failures. Back to Forrest Gump. While his North Star is his simplicity, his Kryptonite is that he is slow. Make sense? What’s fascinating is that your North Star and Kryptonite are usually traits sitting on opposite sides of the spectrum. 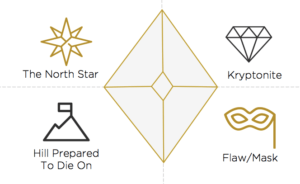 Your North Star is really your Kryptonite in disguise. For example, if your North Star is your drive, your Kryptonite might be your impatience. If your North Star is your unwavering commitment, your Kryptonite might be your obsessiveness. So, what is YOUR Kryptonite? Reflect back on all of the times you’ve failed, or come up short in your life. What has been the one determining factor that has really stopped you or gotten in the way? Part three of the Character Diamond is The Hill You’re Prepared To Die On. In a movie, this is typically what gives the protagonist—the main character—the strength to overcome their last battle. It’s what they stand for, no matter what. Forrest Gump stands for love. It is the Hill He Is Willing To Die On. For you, it may be freedom. It may be love. It may be forgiveness and giving people a second chance. Think about your #1 value—the thing that is so important to you that you would be willing to die on a hill for it. Lastly in The Character Diamond, we have Flaws and Masks. This is how we cover up our vulnerabilities and insecurities. They act collectively as a protective outer shell, used to hide, deny, or “mask” our greatest flaws. In a movie, Flaws and Masks show themselves whenever the protagonist is getting stuck, bringing their insecurities and vulnerabilities to the fore. So they show up with a Mask to hide their flaws. One of my personal Masks is trying to be super smart and well-researched. That’s because one of my insecurities is being comparatively young in my industry. I always need to know that much more than everyone else around me because I feel I need to make up for the age gap. If you’re a woman, maybe your Mask is being extra sharp, controlling, or strong in the business realm because you feel like you need to compensate for your gender. Others examples of Masks include pride, having a temper, being impulsive or reactive in the moment, or believing that your way is the best way—or losing just it on other people. Think about the things that get in the way of you showing up as the best version of yourself (insecurities included). This one can be difficult for us to recognize. To help you unveil it, think about the people who know you, but not very well. What is the biggest misconception they have about who you are? What do people say about you when you’re not around? You can go through this process on your own. Or, you can click here to watch our training, where I walk you through the entire process I used for myself and over 50 entrepreneurs in the past year. When you know what your North Star is, you’re able to double down on it and make sure you’re focused on building a business, working on projects, and aligning yourself with people who add value to your life. When you know what your Kryptonite is, you can put up guard rails to make sure you don’t fall off the deep end. When you know what the Hill You’re Prepared To Die On is, you’re able to communicate this with others and make sure you’re only doing things in your life that are in alignment with it. When you know what your Masks and Flaws are, you’re able to recognize when you are feeling vulnerable and insecure—and what you do to cover up those insecurities. When you consciously recognize this, you can adapt accordingly to show up as your full and true self. The better you understand yourself, the more you are going to be able to show up fully as the main character you want to be in this movie called life. For a step-by-step walkthrough of how you can use this process to better understand yourself and humanize your online persona to connect with more of your ideal customers: click here to get our training, The Character Diamond.